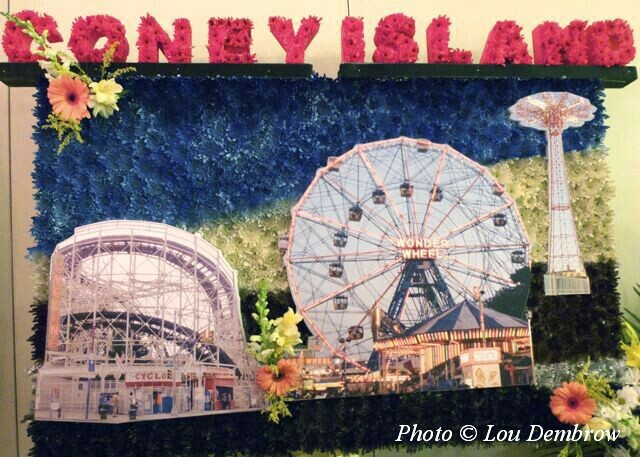 At the wake for Coney Island ride maestro Andy Badalamenti, our eyes were drawn to this special floral tribute featuring photos of Coney Island’s Cyclone, Wonder Wheel, Parachute Jump and Polar Express. It was sad to say goodbye to Andy, whose casket was adorned with touching photos and mementos from the past. If there’s a midway in heaven, we’re sure he already has “the ex” on the Himalaya. 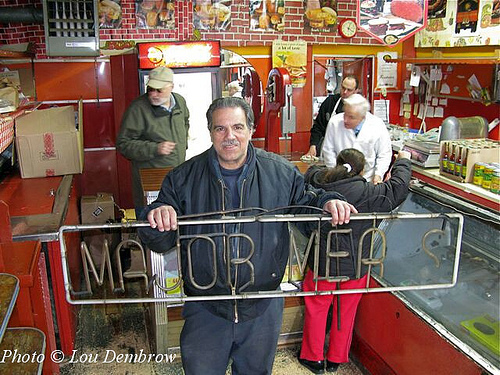 Thanks to photographer Lou Dembrow for this photo and the one below taken on closing day of Jimmy Prince’s Major Meats, Coney Island’s oldest butcher shop, which shuttered after 60 years in 2009. The exquisite floral tributes at the wake also included a rosary with beads made of rosebuds and a horseshoe from Andy’s friends in the NYPD mounted police unit. An honor guard of mounted police kept watch outside the funeral home and an officer stood at attention by the casket. Andy worked for the past 11 years in the stables at Brighton Beach. Historian and Coney Island History Project director Charles Denson’s moving photographic tribute features many photos with his friend’s beloved horses and cat. Watch for the photo of Andy riding the Steeplechase horse into the clouds as Pavarotti sings the aria “Nessun dorma” from the final act of Puccini’s Turandot. What a happy/sad portrait of Andy & his love for those horses…. Just beautiful . Thank you. The animals’ body language said they loved him. Charles Denson’s portraits of his dear friend, Andy are exquisite. rest in peace my friend. I will always miss you and I will always love you. I will never forget the good times.